According to the Center for Disease Control, on average, 130 Americans die every day from an opioid overdose. Right now, inside a Massachusetts federal courtroom, Massachusetts attorney general Maura Healey is up against pharmaceutical giant Purdue Pharma LP, maker of the controversial drug OxyContin, and its owners, the Sackler family. In Commonwealth v., Purdue Pharma L.P, the suit alleges that the Sackler family benefited financially by allegedly pushing painkillers onto doctors and patients while reaping billions over the course of a decade, all while contributing to the deadly opioid epidemic and impacting thousands nationwide. On Lawyer 2 Lawyer, host Craig Williams is joined by Attorney Jonathan Novak from the Fears Nachawati law firm and Joanne Peterson, founder and executive director of Learn to Cope (LTC) as they take a look at the opioid epidemic and discuss the impact, litigation against big pharma, what is being done to assist victims of opioid addiction and their families, and where those impacted can get help legally and personally. Attorney Jonathan Novak is from the Fears Nachawati law firm, where he uses his background as a former U.S. Department of Justice, Drug Enforcement Administration litigator to advise clients in multiple areas including opioid and mass tort litigation. Joanne Peterson is the founder and executive director of Learn to Cope (LTC), a non-profit peer-led support network which began in 2004. Jonathan Novak: We need to re-educate our doctors, we need to re-educate our parents, we need to re-educate our children and we need to stop treating these victims like their pariahs. Joanne Peterson: A lot of times it happens by accident, it might just be an innocent 17-year-old football player that gets hurt and breaks the collarbone, goes to the emergency room and ends up on these drugs. And there’s not always enough education that it’s highly addictive and sometimes their parent may not realize that just after a couple of days taking this drug, they may get heavily addicted to it. J. Craig Williams: Welcome to Lawyer 2 Lawyer on the Legal Talk Network and our calendar says it’s a Chinese Happy New Year, so Happy New Year. I’m Craig Williams coming to you from Southern California. I write a legal blog called ‘May It Please the Court’ and have two books out titled ‘How to Get Sued and The Sled’. Before we introduce today’s topic we’d like to thank our sponsor Clio. Clio’s cloud-based practice management software makes it easy to manage your law firm from intake to invoice. You can try it free at clio.com. According to the Center for Disease Control on average a 130 Americans die every day from an opioid overdose. Right now, inside of Massachusetts Federal Courtroom, the Attorney General Maura Healey is up against the pharmaceutical giant Purdue Pharma, the maker of the controversial drug OxyContin and its owners the Sackler family in the case titled Commonwealth v. Purdue Pharma, LP. The suit alleges that the Sackler family benefited financially by allegedly pushing addictive and deadly painkillers to doctors and patients while reaping more than four billion in profits over the course of a decade from opioids in all while contributing to the deadly opioid epidemic and impacting thousands nationwide. A spokesman from Purdue responded to this suit by stating, Massachusetts seeks to publicly vilify Purdue its executives, employees, and directors while unfairly undermining the important work we have taken to address the opioid crisis by taking out of context snippets from tens of millions of documents and grossly distorting their meeting. Well today on Lawyer 2 Lawyer, we’re going to take a look at the opioid epidemic, the impact of litigation against big pharma including the Commonwealth v. Purdue Pharma case, what’s being done to assist victims of opioid addiction and their families and how those that are impacted can get up legally and personally. And to do that, we’ve got a great lineup of guests today. Here to discuss today’s topic is Jonathan Novak, he’s an attorney from the Fears Nachawati Firm, where he used his background as a former US attorney at the Department of Justice and the Drug Enforcement Administration as a litigator to advise multiple clients in multiple areas including opioid and mass tort litigation. Welcome to the show Jonathan. Jonathan Novak: Thank you for having me. J. Craig Williams: And our next guest Joanne Peterson, she is the Founder and Executive Director of Learn to Cope, that’s a non-profit peer-led support network that she started in 2004. Joanne’s journey started as a young girl with siblings experiencing issues with mental illness and addiction. Years later, when Joanne discovered that her own son’s experimentation with prescription drugs led to an opioid addiction, she was motivated and empowered to use her voice to bringing about change. And welcome to the show, Joanne. Joanne Peterson: Thank you very much for having me. J. Craig Williams: Well Joanne, you have some pretty personal experience here if you wouldn’t mind, give our listeners a bit of a background about what is going on inside the actual opioid addiction problem? Joanne Peterson: Well this has been going on for many years. We are on our 15th year of watching people lose their lives and families lose spouses, children, grandchildren, grandparents raising grandchildren today and legitimate patients as well that started off with an injury and ended up either dead or with a terrible existence in life. So it’s just, it’s been a problem for many, many years, so we’re just grateful to see it finally being exposed for what it truly is. J. Craig Williams: Jonathan, how does this problem found its way into the courts? How is it being approached from the judiciary standpoint? Jonathan Novak: Well, unfortunately attempts to use the existing regulatory laws began falling short as DEA enforcement actions have dropped off. Right now, we’re seeing a massive national effort to hold the manufacturers, distributors, and now the pharmacy retailers responsible for violations of law. The civil lawsuits are seeking damages under a similar theory to the tobacco litigation, which is to say primarily public nuisance. However interestingly, they are also bringing in claims of civil conspiracy and RICO claims, which are the Racketeering claims often used against mafia. These cases have been brought in the Federal Courts as part of a multi-district litigation, that is in Ohio right now and being run by one judge and thousands of lawyers across the country are participating in the work that’s going on in this litigation. J. Craig Williams: Joanne, how has Learn to Cope approaching the problem? Joanne Peterson: Well, what we’re here for is to take care of the families and get them through the worst days of their lives whether they’re losing loved ones or they’re trying to find treatment for loved ones, trying to afford treatment in just the entire process, which can take an average of seven years for someone to literally find recovery if they’re lucky enough to find it. It rips families apart, it ruins marriages, people lose their homes trying to afford treatment, they take out second mortgages, they’re trying to afford to raise grandchildren when they’re at retirement age or they may have one child that they’re paying for their college tuition and then they’re raising a toddler and they may have elderly parents. So what we do is really try to pick up the pieces from the disaster that Purdue Pharma caused all those years ago, the ripple effect of that is going through generations. So we’re also a provider for nasal naloxone for the Department of Public Health here in Massachusetts. So nasal naloxone is an antidote for overdose, it will reverse an overdose and we literally, we have 25 meetings, chapters across the state that meet weekly and at every single meeting, Monday through Thursday night, we’re giving out NARCAN. We’ve had close to I think and now, it’s up to about 140 overdose reversals since we started giving it out in December of 2011. But that just goes to show what’s happening here people are finding their loved ones overdosed in the driveway or they wake up in the morning and they’re deceased in their bed after they’ve come out of treatment and it’s just — I could go on and on, it’s just a disaster of what’s happened and we’ve had a generation that’s really been affected by this and it’ll go on for a long time. We have many orphan children that in the next ten years will be teenagers so with elderly grandparents trying to raise them. So it stretches out far and wide the consequences of what they did. J. Craig Williams: Now you say, you mentioned you had 25 Chapters, you’re talking about 25 Chapters across Massachusetts. J. Craig Williams: What kind of support is available in other states? Joanne Peterson: We actually get calls from other states asking us to help them start chapters. There are other groups around the country and it’s people coming together just trying to help each other and share resources and information. We’re very lucky here in Massachusetts to have access to NARCAN, but there are many states that they do not or I don’t — I think we’re the only group in the country that we have parents and facilitators that are trained to give out NARCAN. So it’s a gap and it’s a need around the country, we’re just very fortunate to have been able to come together here and we get support from the State of Massachusetts which is wonderful. J. Craig Williams: Jonathan, you mentioned that the DEA has had a change in its practice in terms of enforcement, what’s the thinking behind that? I mean is this not a problem in their view or what’s going on? Jonathan Novak: That’s a question that a lot of people have been asking for a lot of years now. DEA initially was primarily focusing on doctors and pharmacies and pill mills. Their work was shutting down really bad pill mills down in Florida and what we found was every time we shut down a bad doctor or bad pharmacy, another two popped up to fill the void. The market had already been created. We already were in the middle of an addiction epidemic. So the way that the controlled substance market works in the United States under the Controlled Substances Act, you have the manufacturer who makes the pill and then they are not allowed to sell it directly, so they sell it to a distributor. The distributor ships the pills to a pharmacy and then the pharmacy fills the prescription written by the doctor. Every one of them has an obligation under the law. The obligations include monitoring and ordering suspicious orders, don’t fill prescriptions that aren’t for legitimate medical purpose very similar and so, using that theory, DEA began to go higher up the food chain, instead of pharmacies we started going after distributors. The national distributors for opioids there are primarily three who own 85% of that market. When we started suing them, we started getting really big record-breaking fines and settlements. Unfortunately, at that time we started to get new orders from on high not to go after the manufacturers or the distributors anymore. The attorneys that I was working with began leaving DEA to go and work for industry such as Cardinal Health or McKesson and then management at DEA inexplicably began slowing down enforcement actions. An enforcement action that at the end of 2013 was ripe and ready to go and we were going to go issue an immediate suspension order and shut down a bad doctor or a bad pharmacy or manufacturer or distributor. When new management came in, they basically said no the case law is different now, we’re not going to do it that way. Enforcement actions dropped from almost 200 in 2011 down to less than 30 in 2016. There’s a lot of questions as to why that would happen, it seems like there’s a lot of outside influence. Cardinal health drafted new legislation which took away DEA’s regulatory powers and that was passed unanimously. So, there are a lot of pieces moving here, but all of them seem to be that the industry doesn’t want to be regulated and they have the power to make itself. J. Craig Williams: Well, as you take this as a comparison to the drug war according to the Centers for Disease Control and Prevention from 1999 to 2017, 400,000 people died from an overdose involving an opioid. So, how do people go about getting these opioid prescriptions and how do they get a hold of this drug if everybody knows it’s such a bad thing, I mean, doctors have to now know about this crisis. What’s happening on the practical side of this? Joanne Peterson: Well it’s pretty simple to get an opioid prescription. Even today, we’re still hearing about it. There’s more information of course about it, but it’s still happening, you can have a minor injury and walk out whether a prescription with 30 pills and you can have wisdom teeth removed and it’s become so highly marketable on the street. Sometimes, people would even go and have teeth removed so that they could get these prescriptions. So and a lot of times it happens by accident. It might just be an innocent 17-year-old football player that gets hurt and breaks a collarbone, goes to the emergency room and ends up on these drugs and there’s not always enough education that it’s highly addictive and sometimes their parent may not realize that just after a couple of days taking this drug they may get heavily addicted to it. So, a lot of the families that I’ve met over the last 15 years it happened that way or young adolescents out there experimenting. I know many that were at high school graduation, proms or parties and young college students where these prescriptions would be passed around and they thought that they were just going to party one night and be okay the next day and that was just not the case. And back in the days when it was the 80 mg OxyContin pills that had the time-release, they would wipe off the time-release and crush it and snort it and when you removed the time-release and snorted an 80 mg pill, it was basically like snorting straight heroin. And it only takes a couple of days for your body to actually need that so that you’re not sick and it would take a young honor student or a few days to eventually turn to heroin when they couldn’t afford the $80 a mg pill on the streets. So if somebody went and got a prescription for OxyContin and they had 30 pills and can sell them for $80 per pill then that’s highly marketable for drug dealers to get a hold of it, it became a very, very sought out drug to make money, to addict people and just — it just turned into this huge business on the streets aside from patients becoming addicted accidentally. J. Craig Williams: Well, we need to take a quick break and before we move on to our next segment, we’ll hear a message from our sponsor and be right back. J. Craig Williams: And welcome back to Lawyer 2 Lawyer. I’m Craig Williams and we are joined by attorney Jonathan Novak from the Fears Nachawati Law Firm and Joanne Peterson, the Founder and Executive director of Learn to Cope. We’ve been talking about the opioid epidemic and litigation against Purdue Pharmaceuticals, one of the big farmers that manufactured opioid addictions and we’ve been talking with Joanne about the on-the-ground day to day situation that’s occurring with opioid addictions. Joanne, once kind of a follow-up question to where we were right before the break, what happens after you’re addicted to OxyContin what — is there a recovery program and how willing are people to get into it? Joanne Peterson: That’s the hard part about this. There are recovery programs but one, they can be very expensive; two, if you’re no longer working anymore because you’re heavily addicted and your whole focus becomes how will I get my next pill or how will I get more of the medication so that I cannot get sick. So it becomes a 24-hour job just to continue with their addiction and they lose everything. They lose their families, they lose their job, it’s just — it’s heartbreaking the whole process and it is quite a process because they lose themselves, that’s the best way I can really explain it. It takes a long time for the family to get educated to understand what they’re dealing with, to understand the whole continuum of care and the treatment process, how to find it, how to afford it, and somebody can go into treatment 10, 20 times and it can take years for them to actually find recovery if they’re lucky. So it’s, it’s a very, very hard addiction to recover from and to beat and once they have this addiction if they don’t work really hard at staying away from the drug, they relapse and relapse happens for years before they — it took my family member almost four years before he could put one year together and that was in and out of detox. The family learning, our family learning that the first treatment center was not going to be the last. Also, another issue is there’s a lot of businesses that have popped up in that industry now where there’s really fraudulent things happening; medical insurances, there’s a lot of fraud that way, there’s people that will buy a house with five or six bedrooms and call it a treatment center and it’s just a big empty house. So, getting the right information, the correct information is very, very hard, navigating the treatment system, insurance companies, it’s extremely difficult and when you’re heavily addicted to these opiates, you’re not functioning like you are used to. It can take a person that had a very high-level position as it happens to attorneys, it happens to medical professionals, it happens to anybody and once it does, it’s very hard to get their life back. And oftentimes, they can never go back to what they lived before. So it’s a really heartbreaking situation. So we are there really to help people get through it. J. Craig Williams: It sounds terrible. Jonathan as I’m listening to Joanne and the first year torts class is flashing in front of my memory of the theories of tort liability for this and all of the problems associated with it, but I want to talk about that but in the context of your plaintiffs, I mean, you have I’m sure lead plaintiffs and people that are out from the addiction crisis so that our plaintiff suing against this kind of put that into context for us. How you translate what Joanne has gone through with her family and her situation and then how that blends into the plaintiffs that you see and what the theories of recovery are? Jonathan Novak: Absolutely. And first and foremost, my work is doing litigation and hopefully to benefit people like Joanne and her program who are out there actually helping on the ground level and helping individuals. I have a brother who suffers from addiction problems here and every single day of my life I fear that I’m going to get that phone call. And when we talk about recovery here, we’re talking about money, but we’re also talking about how do we get these plaintiffs right and how do we get our society right. The series, we’re suing on behalf of public entities. We sue on behalf of the State of Utah or the City of Santa Fe or Howard County, Maryland, and these are some of my clients. We have clients all over the country. What we’re looking to do is similar to the type of thing they did in the tobacco litigation. We want to hold these parties responsible and then we want them to pay, to fix the problem that they deliberately caused. So when we’re talking about costs, you can calculate how much NARCAN every first responder in every county has to carry, and how much they’re spending on it, and that’s a cost that every one of our clients deserves to recover. Medicaid costs on behalf of the state, but it’s more than that. This is not a problem that fixes itself with money. The thing, the reason we talk about the tobacco litigation is, as part of the settlement there, tobacco companies paid for abatement. They paid to get people to stop smoking. They paid to change the marketing and the message and what we need to do here is we need to provide money to communities all over the country to fund long-term treatment, because 28-day programs do not work for opioid addiction. We need to fund, the NARCAN that’s getting carried by every first responder and police officer in every community in this country, which are usually through unfunded mandates, which means the county has to find tax money to pay for that. We also need to re-educate. We need to re-educate doctors who were given completely, just absolutely fabricated misinformation about opioids and their addictive nature which caused this flood, the blizzard of avalanches as the Sackler family said. That was what they wanted. They misinformed everyone. We need to re-educate our doctors. We need to re-educate our parents. We need to re-educate our children and we need to stop treating these victims like they’re pariahs. The Sackler family refers to people who are addicted as junkies. These are not junkies. These are victims and we as a society need to stop blaming them. We need to work with our family members and our communities so that we can heal, and that’s what these lawsuits are seeking to do. We’re seeking to recover money for the communities so that they can heal themselves. It doesn’t make sense for the Federal Government to dictate what Havre de Grace, Maryland does in terms of fixing its own problems. That money should go to Havre de Grace, and they should figure out what works in their community. And that’s how this is different. That’s why we’re looking at the tort liability here and because of the nature of what these companies did, the ignoring of Federal Law and State Law, the malicious, thoughtless, heartless way that these companies pushed opioids which they knew were addictive, creating a market, not caring, bringing in billions of dollars. We need to hold them accountable and then we need to start the process of changing everything, so that we understand what people have understood for hundreds of years, that opioids are dangerous. That they’re addictive, that there’s a time and a place for them, but that we are way beyond that now. J. Craig Williams: Jonathan, is it naive to think that one of the obvious solutions is to stop the production of OxyContin? Jonathan Novak: Yes. For a number of reasons, I wouldn’t say naive, it’s hopeful. But what we know is there’s a time and a place for opioids in general. Cancer, end-of-life cancer pain or when you break your leg and they give you two pills to get you through the first night. We need to put science towards looking into pain relief that’s not addictive, but we can’t — also simultaneously, can’t take away a tool that has been used for generations. There has always been a fear of over-prescribing and over using opioids but they’ve also been recognized for as far back as medicine goes, that there is a good use. There is a time when that kind of pain relief is useful. Unfortunately, with the advent of the fifth vital sign being pain, we started to believe that opioids were a magical pill with no bad side effects, that improved everyone’s value of life that we could just keep taking higher and higher dosages, because opioid naive people didn’t need to start on the lowest dosage, they could jump all the way right up to the 80s or heaven forbid the 160s that were out for a while. There is a time and a place in addition just as Fentanyl originally came in lozenges, because it was for patients who had cancer and the pain was so bad they couldn’t swallow, so they could take a lozenge and have slow-acting pain relief. That’s not something that we should be enjoying recreationally and we need to get out and change that message, but that is something that if I had a loved one who was suffering immensely from cancer pain and couldn’t swallow, I would want them to have access to something like that. This gets back to though. We need to get our doctors and our pharmacists to understand time and place situation in which that’s an appropriate remedy. J. Craig Williams: Well Joanne, let’s kind of deal with the practical end of this. We have talked about the problem, but let’s talk about how we get people on the right solution. You find what advice do you want to give to family members that are going through this and pray that potentially someone listening to the podcast is actually going through it themselves, what’s the next step, what do they do? Joanne Peterson: What we like to offer is support, education, resources and hope. Families really need hope. They need to hear hope and they need to see hope. When I first started to go through this, I had gone to a meeting and I raised, it took me forever to raise my hand because of the stigma and the attitude out there that your family members are just junkies. I went to a meeting and I raised my hand finally after we were suffering for so long trying to figure this out on our own. Because the first thing a family member or parent especially does is blame themselves. What did I do wrong, how did this happen, I thought I did everything I could to raise my son or daughter and keep them safe and teach them about drugs and alcohol and then this happens. So when you finally come out and raise your hand and ask for help, you should get it and I didn’t. It was more, this meeting is not about your son, this meeting is about you and I said no, it’s about my son, he’s 18 and he’s going to die. I don’t know where to go. I don’t know what to do. I was looking through the yellow pages for help and there was really virtually nothing other than just let go, there’s nothing you could do. And as a child, when I was a child I did have a brother and a sister with alcoholism and mental health issues and it was the same thing. No one would talk about it. It was sort of the hidden secret because everybody was afraid of what someone would think about them, and I said, I need to change things. So I wanted to have a place where I would be educated on addiction and how does it happen, how do you find treatment for it. What is treatment? What does it look like? How do you pay for it and so at our chapters, you can walk into one of our Learn to Cope chapters and there’s 60 to 80 people in those rooms every week. That’s how large this issue is. So what we try to do is add education for the families. So one, they can start to heal and not blame themselves. Two, they can take action because they’re understanding what’s happening to their loved one and it takes over their brain, it takes over their body. So you have to literally step in sometimes and find that information for them and try to learn how to motivate them to go to treatment, which is not an easy thing to do. And you go to bed at night with your pocketbook under your pillow because they need money in order support this habit and what ends up happening is somebody that worked every day and got A’s in school and graduated and went to their first year of college, a year later after this they’re stealing jewelry and yard tools out of the garage and bringing it to pawn shops, so that they can continue to feel normal because they’re so heavily addicted and they get so sick without it. So the entire family needs education. J. Craig Williams: Joanne, how can our listeners reach out to you if they’d like to get this kind of help? Joanne Peterson: Sure. We have a website, it’s learn, it’s www.learn2cope.org and you can click on Contact Us and find us that way or you can call our office. We also have on our website a private family forum that family members can join that, there’s over 10,000 families on it privately, anonymously, where you can get help any day of the week and just to talk to another family member or spouse and just get support, resources and help. J. Craig Williams: Great. That’s fantastic. Joanne Peterson: Our favorite people are people in recovery because they give us hope. They show us that people can get better, but we let people know right away that this is not going to happen overnight, it’ll be a long road but you’re not going to go down that road alone. J. Craig Williams: Thank you. That’s a wonderful resource. Thank you for that. Jonathan, I’d like to turn it over to you to wrap up with your final thoughts and your contact information for our listeners, if you please. Jonathan Novak: I am part of a group of attorneys that are going after the corporations who caused this opioid crisis. They caused it deliberately. They’ve made billions of dollars off of it and in my work at DEA, one thing that I found every single time is that these companies do not have any interest in altruism. They are not going to do what’s right and we need to make them do that. For everyone out there, you need to be angry, you need to be informed and you need to take action and whether that’s on an individual level and going out and working in your community or whether that’s making sure that your representatives, that your politicians know that you want them to take action against these companies. Everyone needs to become educated on how we got here and how we can heal. And with that said, I really again want to thank Joanne for the work that she’s doing for people out there who feel desperate and alone, dealing with the addictions of a loved one. This is not where we should be and our generation needs to fight to get everything back in order. If anyone is interested in reaching out, you can contact me through Twitter, it’s @JPNovakEsq or you can email me at [email protected]. J. Craig Williams: Great Jonathan. Thank you very much and Joanne, we really very much appreciate your participation in our podcast today. And it looks like we’ve now reached the end of our program. If you’d like what you heard today, please rate us in Apple Podcasts. 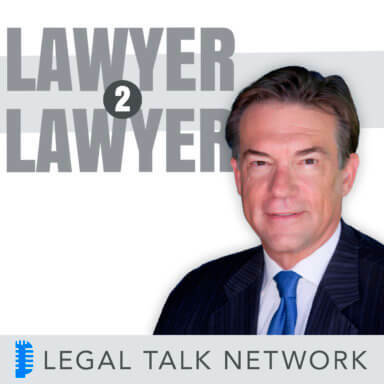 You can also visit us at legaltalknetwork.com, where you can leave a comment on today’s show, and sign up for our newsletter. I’m Craig Williams, thanks for listening. You can join us next time for another great legal topic, when you want legal, think Lawyer 2 Lawyer.